A G T i r e T a l k M T D J u n e 2 0 1 8 54 August 8 – 10, 2018 Georgia World Congress Center, Atlanta, GA REGISTER TODAY! NACEAutomechanika.com/ads8 THIS IS... YOUR FUTURE. YOUR BUSINESS. YOUR TIME. S t a y C o n n e c t e d ! @ A u t o m e c h a n i k a U S @ N A C E A u t o m e c h a n i k a M O R E PRODUCTS AND TECHNOLOGY M O R E TRAINING ON THE LATEST TOOLS AND EQUIPMENT M O R E NETWORKING OPPORTUNITIES tires on the rear of the tractor, the farmer would need to set the inflation pressure to 23 psi to carry the 27,000 pounds for road transport. When the tractor is the field, 23 psi is an overinflated condition to carry the 16,500 pounds. Having the higher inflation pressure will not damage the tire, but it does reduce the tire's footprint. With a smaller footprint, the tire cannot fully transmit power to the ground. is reduces traction in the field and increases fuel consumption. With a CTIS system the farmer could inflate the rear tires on the tractor to 23 psi on the road, and when they get to the field the inflation pressure could be easily lowered to 12 psi. is would give the farmer the optimal footprint and all the tire to generate the maximum traction. NORBERTO HERBENER , OE applica- tions engineer, Trelleborg Wheel Systems Americas Inc.: Because farmers are con- cerned about reducing soil compaction and increasing their equipment's effectiveness, maintaining the right tire inflation pressure is a must. e good news is that tires have evolved a great deal, technologically speaking, and behave according to their construction (design), inflation pressure, applied load and working speed in an interconnected way. If set up correctly, tires will perform as expected. e first step is knowing the load or weight the tires will carry and the speed that will be used to carry that load. With this information farmers can adjust the inflation pressure to gain the highest tire efficiency. What are the goals? e largest footprint for the lowest compaction, with the lowest slippage (due to more lugs being on the ground). Balancing floatation and grip are key. While this sounds easy, with constant changes to the loads and speed of farm equipment, it isn't. is is where variable inflation systems come into play and will become the future standard. 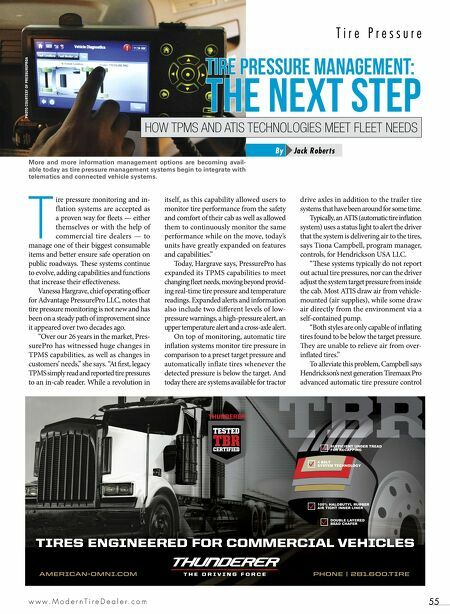 Many equipment manufacturers are collaborat- ing with tire manufacturers on central tire inflation systems (CTIS). 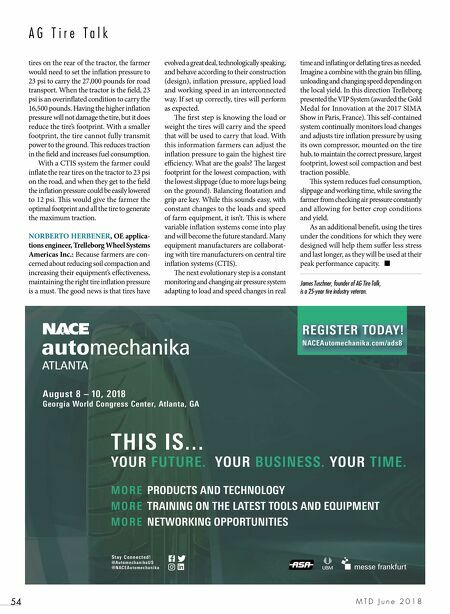 e next evolutionary step is a constant monitoring and changing air pressure system adapting to load and speed changes in real time and inflating or deflating tires as needed. Imagine a combine with the grain bin filling, unloading and changing speed depending on the local yield. In this direction Trelleborg presented the VIP System (awarded the Gold Medal for Innovation at the 2017 SIMA Show in Paris, France). is self-contained system continually monitors load changes and adjusts tire inflation pressure by using its own compressor, mounted on the tire hub, to maintain the correct pressure, largest footprint, lowest soil compaction and best traction possible. is system reduces fuel consumption, slippage and working time, while saving the farmer from checking air pressure constantly and allowing for better crop conditions and yield. As an additional benefit, using the tires under the conditions for which they were designed will help them suffer less stress and last longer, as they will be used at their peak performance capacity. ■ James Tuschner, founder of AG Tire Talk, is a 25-year tire industry veteran.